We still have Gartner's Meats! Portland had a close call yesterday. A fire broke out in Northeast on Monday morning, near NE 75th Ave. and Killingsworth St., at a scrapyard called NW Motors. Sadly, two homes and a duplex were lost in the blaze, and 16 cats in those homes died. Air was so polluted that people in the area first had to shelter in place, then had to evacuate to where the air was clearer. The fire, I'm relieved to say, is now out. And among what's still standing: Gartner's Meats, a decades-old meat market. A lot of my fellow Portland carnivores are devoted to it. It's across 75th from the yard, so people who were following the news (and who could see the substantial plume, which could be seen for miles) were worried for the store. I was one of them. I got less worried when I saw that people and pets were getting shade under the store's front awning during the fight against the fire. Things are better now. The evacuation order is lifted; no people were lost; no more homes were lost. 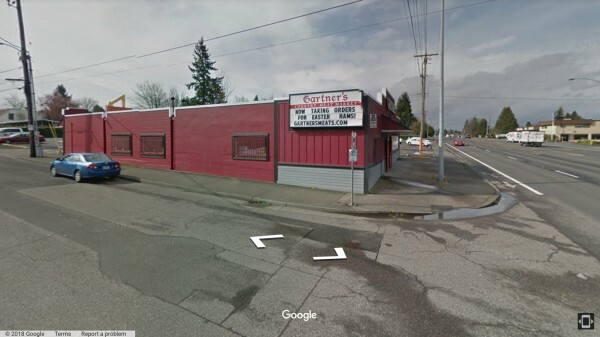 And Gartner's, which has literally been the first stop my family has made when flying into Portland for visits (seriously, it's on the way between PDX and the homes where my grandparents used to live), is still there cutting and selling good meat.